We have seen many storage and memory based products from Crucial over the last few years but none have peaked our interest as much as what we’re taking a look at today. The Crucial MX300 is the latest from memory manufacturer Micron, of which Crucial is a leading division of their consumer driven product range. 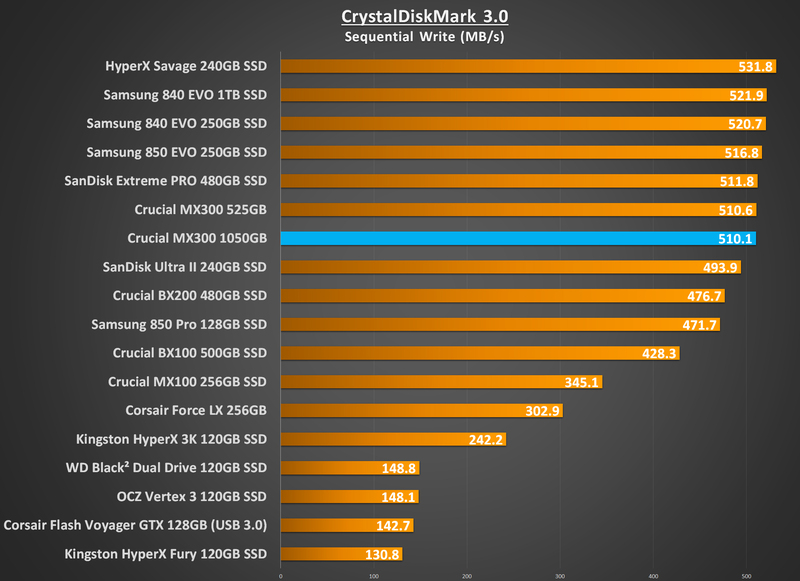 Crucial has released multiple sized options for their latest MX300 range which includes 275GB, 525GB, 750GB and 1050GB models. The reason they are aptly different in size compared to all other drives on the market such as 240GB/500GB/1TB, is that Crucial uses 384Gb TLC NAND as opposed to the most common 256Gb NAND on the market. 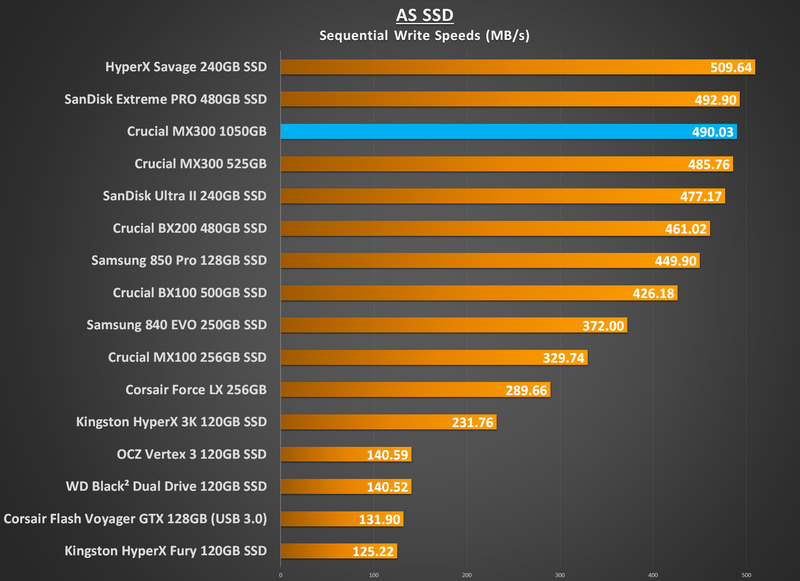 This gives the new MX300 SSDs higher raw density than the rest of the drives available, which Crucial have actually prioritised as well as performance, naturally! 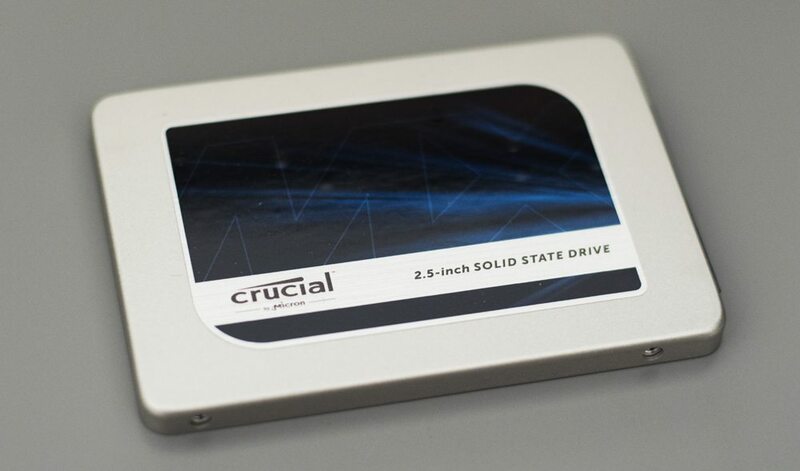 The MX300 SSDs themselves follow Crucial’s regularly seen design of silver with a blue sticker. 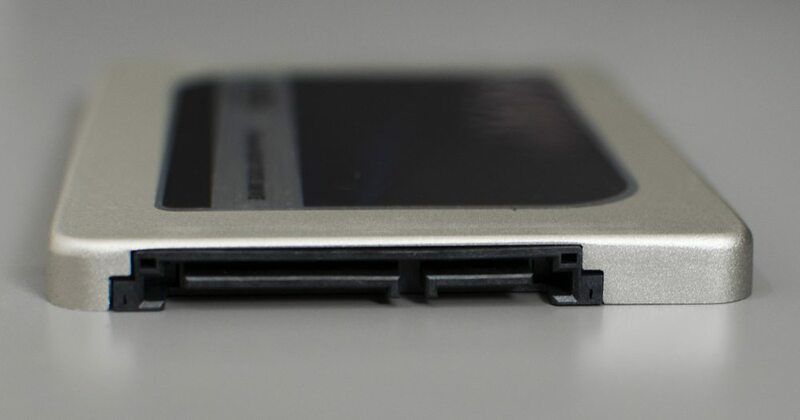 This has been a predominant factor throughout all of the recent Crucial SSDs and if you had one from each class, you would be hard pushed to tell them apart. On the rear of the MX300 SSD, we have the white label containing information such as the model number, the capacity (1050GB in this case), the serial number and of course all the regular safety and manufacturing compliance details. 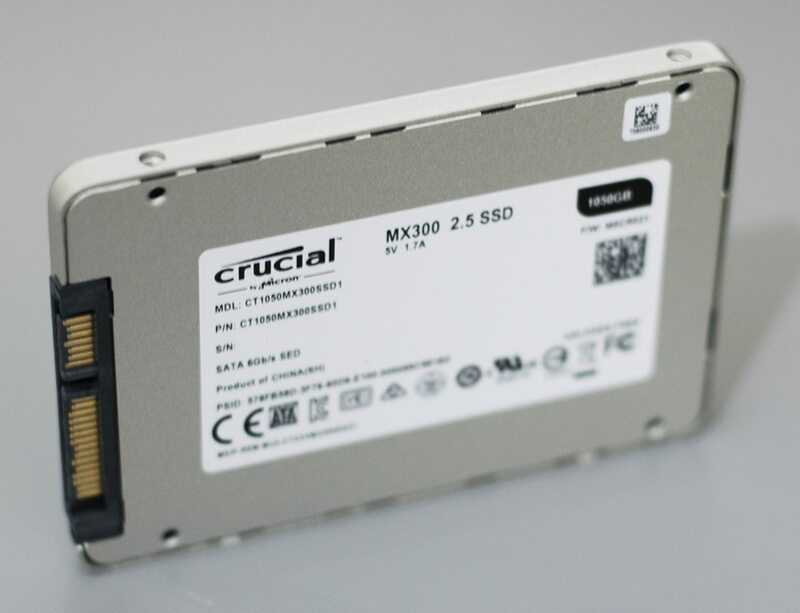 Crucial have equipped the MX300 with a Marvell controller and a SATA III 6Gbs interface; a nice combination alongside the Micron DRAM and Crucial’s new 3D NAND packs. Crucial have gone all out with the MX300 in terms of efficiency with the 3D TLC architecture it uses, which is of course new for Crucial. This should make for some interesting testing and hopefully it will see some nice performance gains over previous generations. Crucial have also added RAIN support onto the MX300 line up which works slightly different to RAID; RAIN stores parts of data on different parts of the SSD itself which should theoretically prevent files from bit decay. Bit decay is when a storage drive matures and slowly deteriorates which not only affects the performance of the drive, but also the integrity of the data storage. Also featured is AES 256 bit encryption and write speed acceleration. 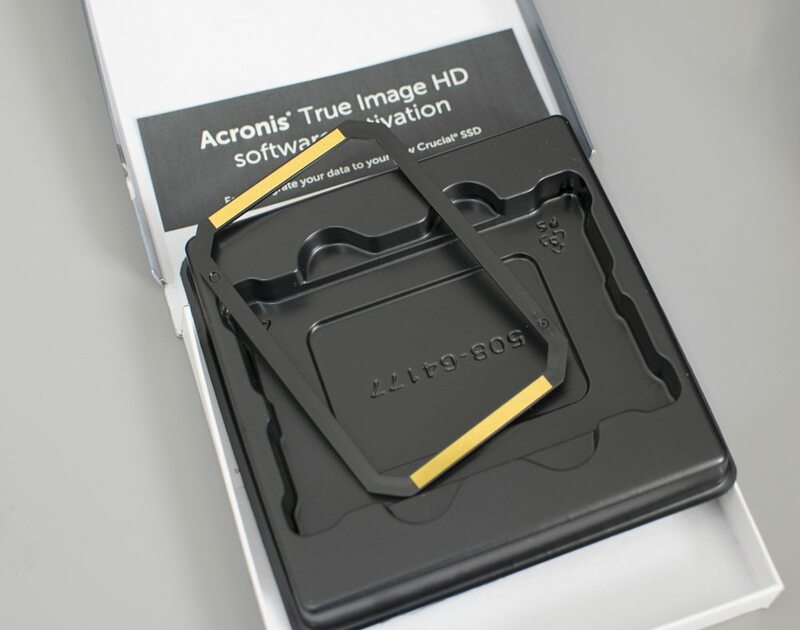 With the Crucial MX300 1050GB drive (and all the others), you get a spacer for notebooks/systems which don’t natively fit 7.5mm drives in snug and a code to Acronis True Image HD; good guy Crucial! All benchmarks are done on a fresh install of Windows 7 Professional 64-bit that is fully up-to-date with Windows Updates to ensure that the performance reflects a real-world scenario and not that of a tweaked benchmarking system. Every benchmark runs for a total of three times and then an average is taken of those results. 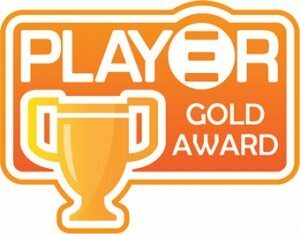 4.75GB Transfer Test – Time taken in seconds to transfer files from our test system SSD; fastest wins! 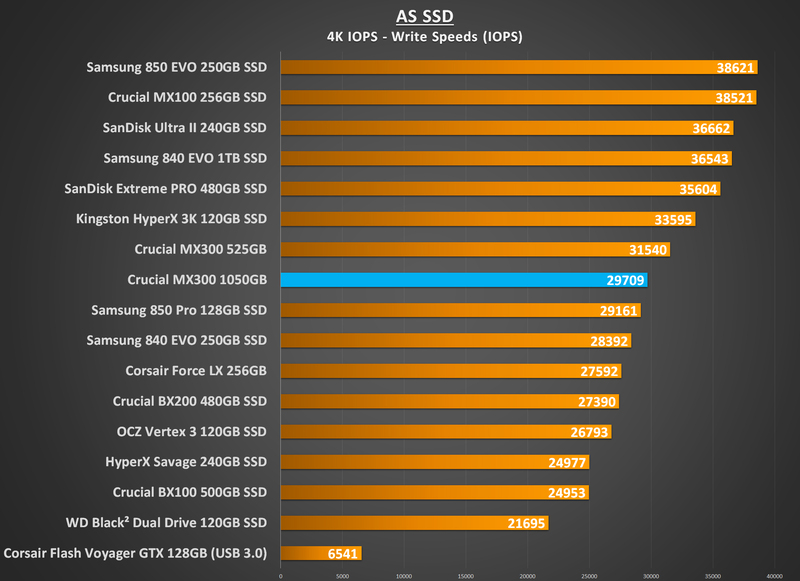 AS SSD Benchmark is a straightforward tool for measuring the speed of your SSD drive. Simply launch the program, choose your drive, click Start, and it’ll test your SSD’s read and write speed in a variety of ways, delivering a score for each when it’s done. And if that’s not enough, there are also additional file copy and compression-related benchmarks available from the Tools menu. (The author’s support page is German only, but if you need further English explanations then there’s a thread on the program at the OCZ Technology forum.). 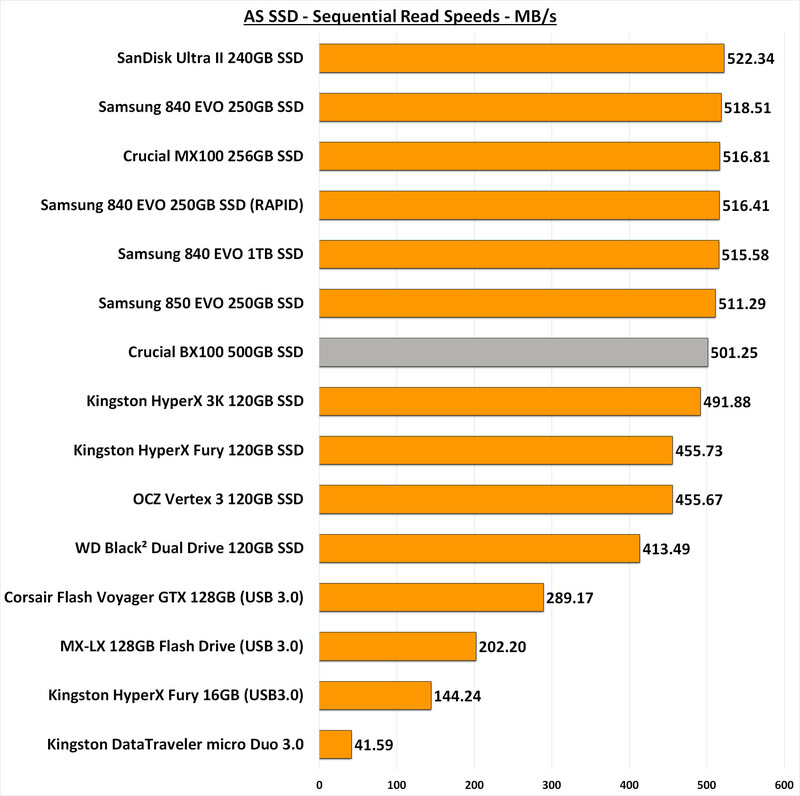 Although the Crucial MX300 isn’t the fastest drive in terms of IOPS or sequential read speeds in AS SSD, sequential write performance is towards the top end of the drives we have tested. 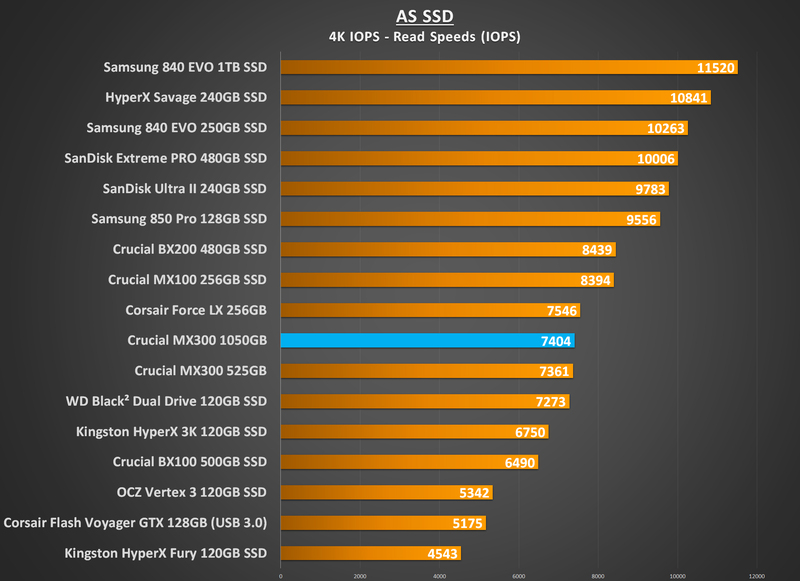 The difference in real world is incredibly slim between the top and the mid level SSDs and actual read and write performance doesn’t out weigh reliability. 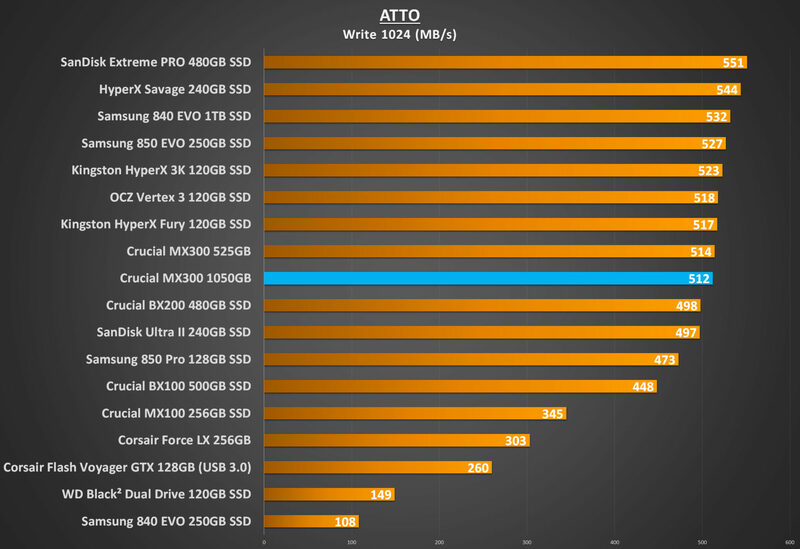 ATTO performance is much better than the results from AS SSD in terms of sequential read and writes. The MX300 not only sits middle of the pack, but it’s above 500MB/s read and write which signals quality. The difference between 530MB/s and 551MB/s is so tiny, that it doesn’t matter so much and once again, I would favour reliability over raw speed in benchmarks. 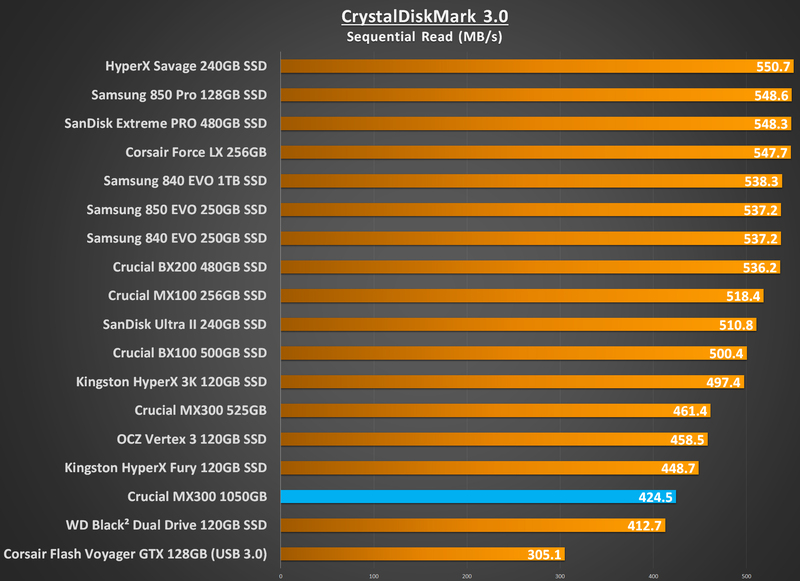 CrystalDiskMark 3.0 tells a slightly different story to AS SSD and ATTO, with the Crucial MX300 falling behind virtually every drive in sequential read speeds. The sequential write speeds however remain very strong; could just be a little flutter in the NAND, but I’m not too worried about it. We have devised a method to test real-world performance via a scenario of a 4.75GB file transfer from my test bench SSD (SanDisk Extreme PRO) to the target device; the one on test at the time. The file itself contains a selection of music, multi-media files and word documents to give real world data; not synthetic files etc. The test will be over the SATA3 (6GB/s) interface as this is the most commonly found on the latest motherboards/SATA compatible devices. So the test itself? Well, it involves transferring via drag and drop into the target drive from the test bench and the time taken will be divided by the amount of data giving us the average MB/s achieved. The lower the better of course! What can I say here? 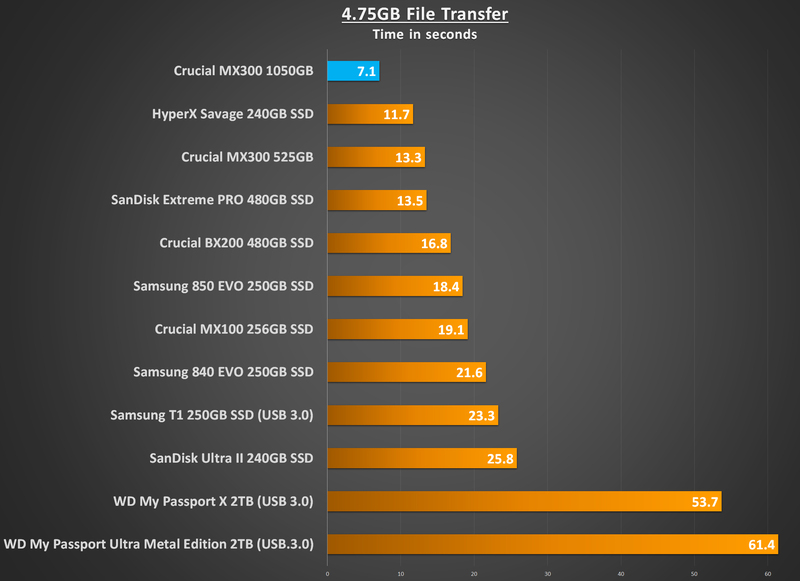 The Crucial MX300 is blazing fast at writing data, even more so than the SanDisk Extreme Pro 480GB by a very large margin; nearly double. 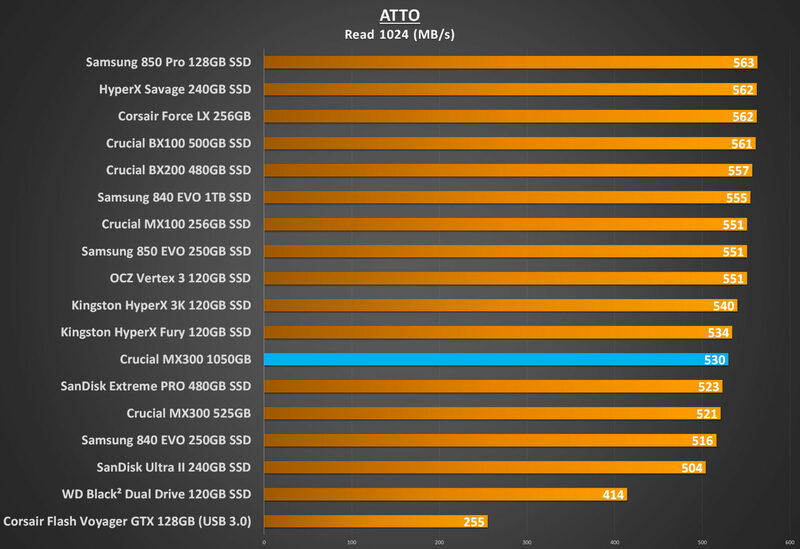 This is why synthetic benchmarks don’t always tell the full story and it’s hard to argue that the MX300 is a solid high performance drive. It’s easy to look at benchmarks all day long when looking at the next product you want, but do synthetic benchmarks count for much in comparison to real world scenarios? Of course synthetic benchmarks do have their place, we wouldn’t use them otherwise, but they do not always give the full picture on a product. 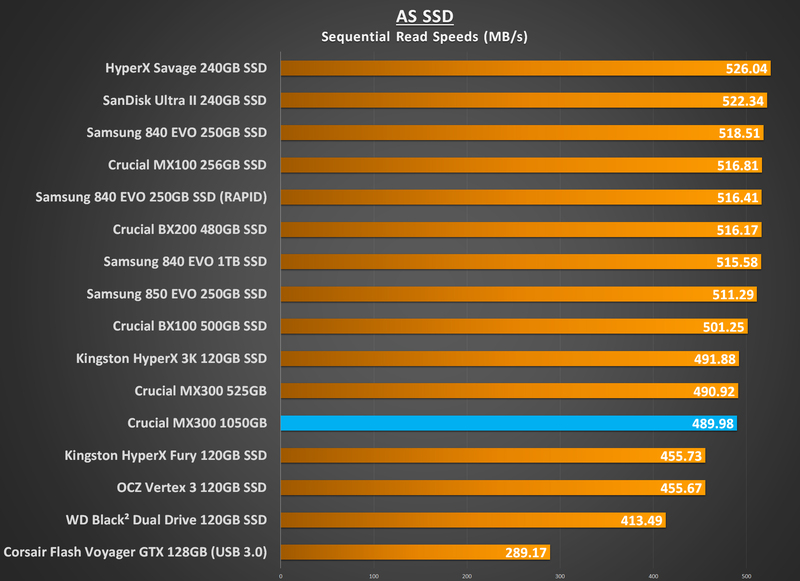 The MX300 SSD from Crucial is no exception and it’s easy to see why Crucial are very happy with their finished product. The Crucial MX300 1050GB SSD has a lot going for it in terms of features, performance and of course, price. £233 for the 1050GB (1TB) version is a fantastic price given that the MX200 drive still goes for £250 on Amazon and when compared to the Samsung EVO 850, it’s even better value still. Crucial have put a lot into the MX300 in terms of features and of course specifications; we cannot ignore this when coming to our conclusion. The AES 256 bit encryption is a nice touch for those data conscious among us and Crucials first step into the world of 3D NAND hasn’t been all that bad all things considered. Although not a new technology, Crucial have taken it and increased the TLC NAND yield from 256Gb to 384Gb; no other brand has done this thus far, so credit goes to Micron and Crucial for increasing storage size. Although the overall performance of the MX300 from Crucial is a bit all over the place, it still offers great real world performance by thrashing the rest of the competition in our 4.75GB transfer test; something not to be sniffed at. One thing Crucial have nailed down to the T however is the design and no-one can accuse Crucial of being lacklustre here. The MX300 comes encased in a sturdy thin metal shell which feels and looks much better than plastic; this gives a more premium feel to the drive. Speaking of premium, the MX300 range comes with a 3 year warranty and a real focus on enterprise level reliability, so those purchasing this drive should feel confident that the SSD they are getting is an SSD that will last! If you’re looking for an inexpensive option with a few extra GB on top of a terabyte and demand reliability, then the Crucial MX300 is one of the best options currently on the market. We can look past the inconsistent performance in the benchmarks to see that this offers great value for money, not just for this particular model, but across the MX300 range itself. 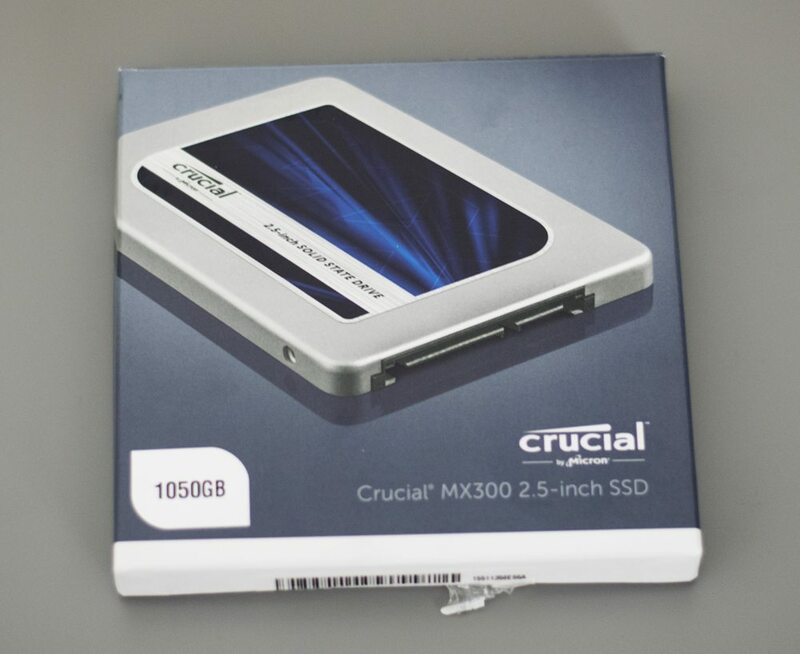 Huge thanks to Crucial for sending in the MX300 1050GB SSD for review.